Tenova LOI Thermprocess offers a wide range of solutions for the steel industry, including batch and continuous heat treatment lines for steel strips, heavy plates and forged components and boasts solid expertise in the construction of controlled atmosphere furnaces, specially hydrogen annealing plants. Tenova LOI Thermprocess technology leads the field of grain-oriented and non-grain-oriented electrical steel, where its latest installations represent the forefront in technology. 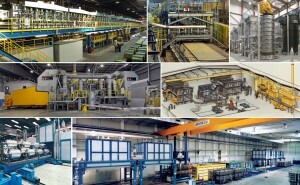 LOI is also active in the fields of heat treatment plants for transmission, engine and other parts for the aerospace, machine tool and automotive industries and semi-finished non-ferrous metal parts, continuous casting and heat treatment plants for light alloys, especially aluminium alloys, and batch galvanizing lines. The plants are equipped with proprietary process automation and control systems, enabling the group to cover the entire heat process cycle as a guarantee for quality, efficiency and innovation.